Amelie Skirt https://www.review-australia.com/au/amelie-skirt-charcoal-black/RE19SK104.REBLK050.html Polka dots never go out of fashion and this Amelie Skirt combines that playful print with a timeless design. The structured skirt also features ruffle detailing around one hip and down the front for that added but of charm. It has a hidden zipper on the reverse and a small split on the back hem. Worn with Tanya Top and Darcy Heels. 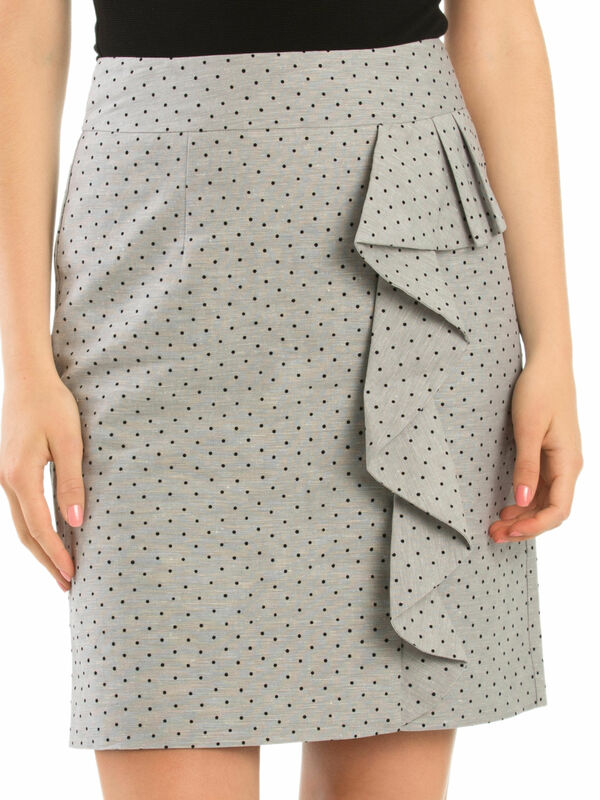 Polka dots never go out of fashion and this Amelie Skirt combines that playful print with a timeless design. The structured skirt also features ruffle detailing around one hip and down the front for that added but of charm. It has a hidden zipper on the reverse and a small split on the back hem. Amelie Skirt is rated 4.8 out of 5 by 4. Rated 4 out of 5 by Michelle1002 from Flattering skirt I liked the details on this skirt, the frill distracts the eye from troublesome areas and it’s a perfect, modern length. It’s on high rotation in my work wardrobe! Only slight negative is that it’s dry clean only. Otherwise I would have given 5 stars. Rated 5 out of 5 by HK R from Love this skirt esp the fabric I simply love the fabric , and the spotted design adds a bit of character to the outfit. this is one of my new favorites actually. Rated 5 out of 5 by MadiKim from Love the fabric and colour and pattern. Great skirt that can be worn casual or styled up for a more formal look. Perfect for a day in the office, just throw a black jacket over. Rated 5 out of 5 by Daisy09 from So happy! Gorgeous skirt. Great cut. Very flattering. Will look great in winter with leggings underneath and nice for the warmer weather too.